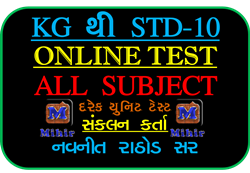 Online Test KG, STD-1, STD-2, STD-3, STD-4-, STD-5, STD-6,STD-7, STD-8, STD-9, STD-10 6 STD-8th Online This 8th Class English Online MCQ Test Semester 1 is very useful for teacher and students. This test open in all device like computer, Mobil, Tablet etc. Online Test is Very useful for Students. they gave this type test in his free time and also at home. student prepared for test and than he will be giving this test. If you Like this Article to comment on below comment box and share it in your groups. Also Search in Google "mihirkumar.in" and Also Search "mihirkumar" on YouTube and Subscribe My YouTube Channel. Join our Telegram and Facebook Page for know about New update of Education And Also Like My Face Book Page "ICT FB Page" on Face book.